Bedroom - a room that is designed for recreation, and as a rule, there is nothing superfluous, but nothing prevents us to add functionality to it and make it even in the home theater. The question immediately arises: why in the bedroom? 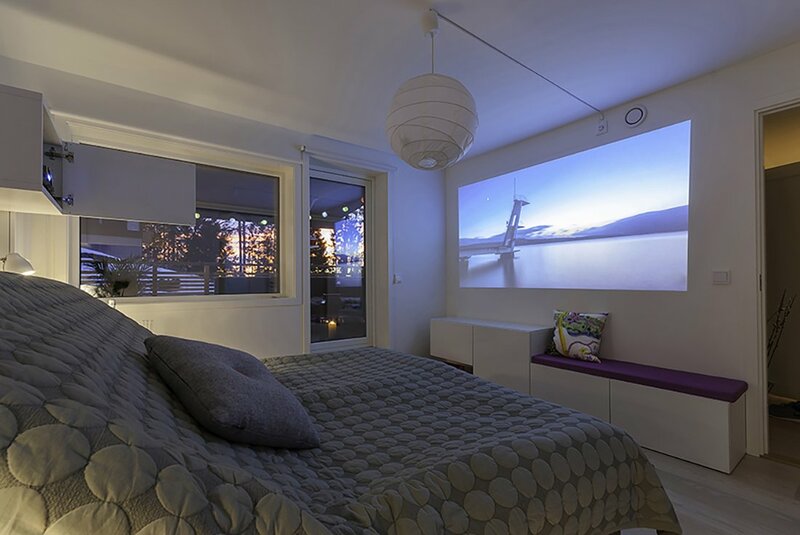 The answer is very simple, in the bedroom has a big bed, which will be convenient to watch long movies, and besides, as a rule, the color of the wallpaper in the bedroom light, without any vivid patterns that will display an image from the projector directly on a wall. 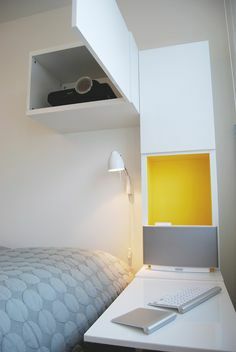 How to install the projector seamlessly, and even to make an unusual bedside table with his hands, Tell our alteration. In order to make theater in the bedroom, only need to buy 3 box IKEA BESTÅ. These boxes offer to establish the right of the bed, but we will install them in an unusual way. To start put a single box, but not so much as drawn in the instructions and turn it on its side. Open the door and fix it so that it would not close. The result bedside table. Based on the technical characteristics of such a bedside table can support the weight of up to 30 kg. The second tier, we need to set the next box, it is not as wide as the base. Remove the lower door. In order not to be seen on the walls of the holes on her offer to seal the entire inside of the colored paper, the proposed form - it is yellow paper. To the left of all this construction on the upper edge of the wall hang the third drawer. It then will be hidden projector. Now, it remains the case for small. It is necessary to lay all the cables to connect the projector to the network behind the boxes, make a small hole for the wires. That such is obtained unusual design that will set the projector to the desired height, thus removing all the wires. 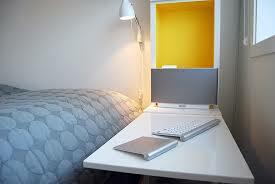 As a bonus, we get more and excellent bedside table Laptop and other gadgets for watching movies.